On 28 June 2018, an exhibition entitled “Masterpieces of Bulgarian Church Art” opened at the State Tretyakov Gallery in Moscow. Prior to the ceremony, a prayer service was celebrated in the Church of St. Nicholas in Tolmachi at the Tretyakov Gallery. 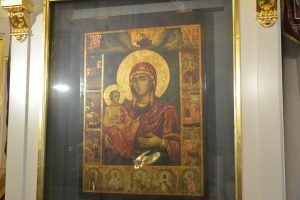 A moleben of thanksgiving before the replica of the Icon of the Mother of God called “Of the Three Hands,” brought from the Troyan Monastery in Bulgaria for the exhibition, was said by Metropolitan Hilarion of Volokolamsk. Concelebrating with him were the hierarchs of the Bulgarian Orthodox Church: Metropolitan Antonij of Western and Central Europe and Bishop Gerasim of Melnik, chief secretary of the Holy Synod; as well as Archimandrite Vassian (Zmeyev), rector of the Representation of the Russian Orthodox Church in Sofia; and Archpriest Nikolai Sokolov, rector of the Church of St. Nicholas in Tolmachi. 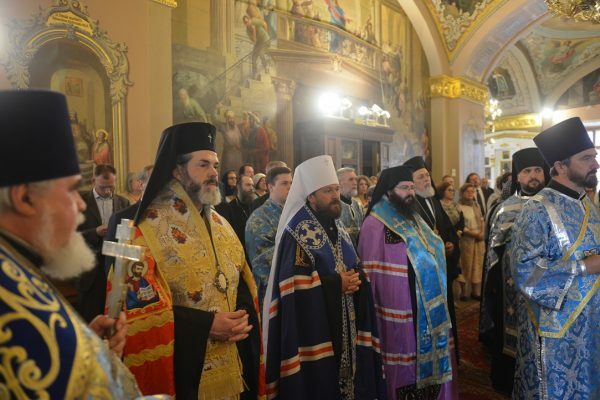 Among those who attended the service were Metropolitan Niphon of Philippopolis, representative of the Patriarch of Antioch to the Patriarch of Moscow and All Russia; Archimandrite Feoktist (Dimitrov), representative of the Patriarch of Bulgaria to the Patriarch of Moscow and All Russia; Mr. Boil Banov, Bulgaria’s Minister of Culture; Mr. Boyko Kotzev, Ambassador Extraordinary and Plenipotentiary of the Republic of Bulgaria to the Russian Federation; and Ms. Zelfira Tregulova, director of the State Tretyakov Gallery. “I am pleased to take part in this important event in the history of cultural cooperation between Russia and Bulgaria – the opening of the unique exhibition of masterpieces of the Bulgarian icon-painting. “The organization of this exhibition in Moscow once again clearly shows that the peoples living under the omophorion of the Russian and the Bulgarian Orthodox Churches have as the precious heritage the one holy Orthodox faith and the Slavonic culture that flourished on this ground – the fruit of the labours of the disciples of the holy brothers Cyril and Methodius, Equal-to-the-Apostles, Teachers of the Slavs. “An important aspect of our common faith is a pious tradition of venerating icons. Serving as an example of the great role of the icon in the life of the Orthodox world is the story of the wonder-working Vladimir Icon of the Mother of God which at the behest of St. Cyprian, the great son of the Bulgarian land, who was at the time the Primate of the Russian Orthodox Church, was brought from Vladimir to Moscow in the 14th century to protect the city from the foreign invasion. After the ceremony all those present were shown around the exhibition of the Bulgarian church art masterpieces.